In this guide we take a look at the smallest electric fireplaces that can comfortably warm up a small room when it’s very cold or chilly outside. There are a number of products that have been designed and built to keep you warm and comfortable during those chilly and cold winter months. Fireplaces have become very popular these days because they not only help to keep you warm during the cold winter season, but they are also very visually appealing and attractive which adds more decoration to your home’s decor. So even though electric fireplaces are a bit expensive, what you get from them is a combination of performance, reliability, durability and of course beautiful aesthetics that will go well with your home’s decor. So without wasting more time, here are our top picks as far as smallest electric fireplaces are concerned. Alcott Hill’s electric fireplaces are consistent with the brand’s overall aesthetic that mixes modern tastes and trends with traditional Americana design. These fireplaces are clean, elegant, and inviting with minimal design so they match with a variety of styles and color schemes. They look nearly identical to a real fireplace but they are less of a hassle than a wood-burning fireplace and less hazardous than a gas-powered one. Electric fireplaces are usually free-standing as well so they can often be moved around whenever it becomes necessary. However, this unit does require batteries at least for the thermostat and batteries are often not included. There is also no blower on the unit so you can’t blow heat throughout the room. The Alcott Hill electric fireplace uses 12.5 amps and with a heating capacity of 5000 BTUs, it can efficiently warm rooms up to 400 square feet. However, without a blower, bigger rooms may take longer to warm up. Electric fireplaces are great if you don’t want to hook up a gas line or deal with gathering wood and tending to a fire but their quality will vary from brand to brand. The Alcott Hill fireplace receives mostly positive reviews on major sites but there are a few downfalls. The shelving units allow you to decorate and store items on the fireplace. It integrates well into most rooms. Free-standing means that it can be moved around. It would also work as a TV stand. The safety feature prevents overheating. It looks realistic and keeps your room comfortable. Some people report low-quality materials. There is no blower or batteries. Overall, the Alcott Hill fireplace can be a great addition to your living room or wherever you do most of your sitting. However, it is bulky so if you are looking for something a bit more minimal, this may not be a good choice. The Alcott Hill fireplace will cost you just over $600 and as far as electric fireplaces go, that’s slightly below average. You also have to add in the cost of the shelving units and keep in mind that not every fireplace will have shelving units. Luckily, you’d be able to finance the fireplace or make multiple payments so that you don’t have to spend so much in one place. The Contreras electric fireplace is a part of Alcott Hill’s product line and, similar to other Alcott Hill products, the Contreras fireplace heats the room through infrared technology. This means that there is a coil wrapped around an infrared bulb that heats up and reflects warm light into the room. Oftentimes, this method offers greater efficiency and better heating. This fireplace in particular is a free-standing piece of furniture with dark colors that can complement a variety of rooms while mimicking the look of an actual fireplace. The fireplace is about 40 inches tall and 45 inches wide so it serves as more than just a fireplace. The mantle can be used as a TV stand or a place for decorations. While this unit doesn’t come with side shelves, you could easily purchase a pair of shelves to place on either side. This unit does feature a stone design but it is faux stone. The Contreras fireplace has a heating capacity of 5200 BTUs, which is slightly larger than some of Alcott Hill’s other products, though the coverage area for this unit is considerably lower than others at 150 square feet. While it may not be as effective in larger rooms, it would be perfect for smaller, more intimate rooms. With the adjustable flame, you can set the mood for any occasion. Whether or not this is the best option will depend on what you are looking for. The Contreras fireplace functions the same as any other electric fireplace but its design is less neutral and may not match with as many rooms. The infrared technology provides efficient heating. It comes with a blower and a screen. It can be an excellent feature for the right room. The mantel can be a shelf or TV stand. It is a stand-alone unit that can be moved anywhere with an outlet. There are no shelving units attached. It has a small heater box. With the blower, it could be noisy. The price for this unit is just over $500, which is below average for an electric fireplace, but you’d still be able to finance it or pay in sections if you need to. The price is mostly justified by the fact that this unit serves as more than just a fireplace. For small rooms, it can be a dominant feature and you will be able to decorate it or even make it the centerpiece of the entire room. The Lauderhill wall-mounted fireplace is a compact, electric unit with somewhat of a minimalistic design. Given that it’s electric, there is no need for a chimney and the unit will mount on your wall similarly to a flat-screen TV. In fact, with the neutral solid-colored frame and the glass front, the unit sort of resembles a flat-screen TV as well. You can choose between a black or a white finish; either way, it’s sleek, modern, and, for the right room, stylish. As a wall-mounted unit, there is no mantle so if you are looking for a more traditional type of fireplace that you can decorate, you would have to find something else. The unit is a large rectangle at 50.4” wide and just 21.6” tall and it will stick out from the wall about six inches. The faux fireplace sits in the center and the outside is glass, which means that you might need to clean it every once in a while. Again, there is no mantle, which also means that there is no assembly required. You will just need to mount the unit on the wall as it is but how you do this might depend on the material on which you mount it. Another positive thing is that you’ll be able to mount this unit either indoors or outdoors. While it can work perfectly for a bedroom or a hangout room, it might also work well for an outdoor patio area, especially one that is enclosed. Even though it’s different from other electric fireplaces, it still produces heat. With 11 amps and 5118 BTUs, you’ll be able to efficiently heat spaces of around 150 square feet. Unless you are using it primarily for looks, you would want to use it in a relatively small room so that it actually heats the area without running constantly. As a sleek wall-mounted unit, its style is a little more specific and may not suit every home. However, it’s also a space saver and won’t dominate the room in the way that stand-alone units do. If you are convinced that you want a wall-mounted fireplace instead of a stand-alone unit, you may like the Lauderhill fireplace. It has a neutral design so you don’t have to worry too much about matching and it’s great if you are trying to achieve a modern look. However, if your home is more traditional, the styles may clash. If you love the look and feel of a fireplace, but aren’t interested in having a live fire in your home, an electric fireplace insert is for you. The Banning wall mounted electric fireplace insert heats an area up to 400 square feet and is a great alternative to gas and wood fireplaces. Its 36-inch size makes it perfect even for fireplaces flushed against the wall, and its tempered glass panel makes it look exactly like a real fireplace. It also comes with a 4400 BTU heater that produces just the right amount of heat for the area you want to make comfortable. 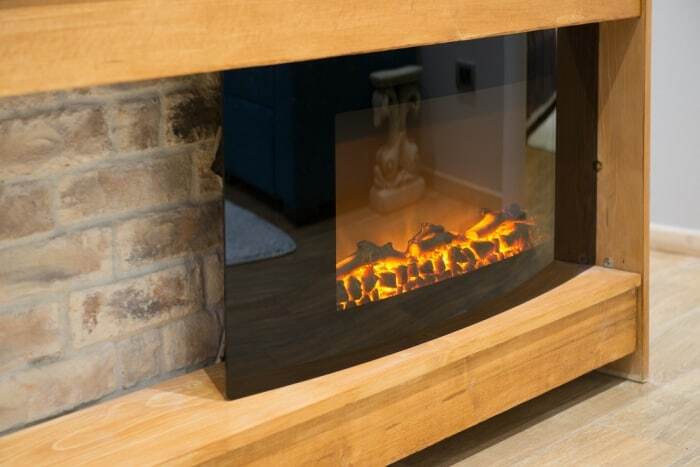 The Banning electric fireplace insert also comes with on screen indicator lights that show both the flame and heater effect settings. It can be used all year long either with or without heat. In addition, there is no assembly required for the insert, and it is a very attractive addition to any living room or bedroom. One of the many reasons the Banning electric fireplace insert is so popular is that it comes with everything you need to get it set up, including the screen, firebox, and an adjustable thermostat. You can enjoy relaxing evenings a lot more often once your insert is installed, and it is so attractive that you’ll want to use it without the heat even in the middle of summer. Despite its low price, it has an elegant and upscale look and heats most living areas and bedrooms without a problem. The hand-held controller makes changing the functions a lot easier, and it comes with an LED bulb that saves energy and lasts a long time. The Banning traditional wall mounted electric fireplace insert is a high quality, reasonably priced product that looks like a real fireplace and does a great job in heating up most rooms. It comes with an excellent warranty and is perfect for both apartment dwellers and homeowners alike, making it a smart purchase for many people. If you’re looking for an electric fireplace that can comfortably heat up or warm up a small room during the cool and chilly winter months, then you can’t go wrong with any of the smallest electric fireplaces that are listed and reviewed above. Even though these models are expensive, they are going to provide you with impressive performance together with beautiful aesthetics that blends well with any home decor. Being electric also means they are more environmentally friendly than their gas and wood burning fireplace counterparts.